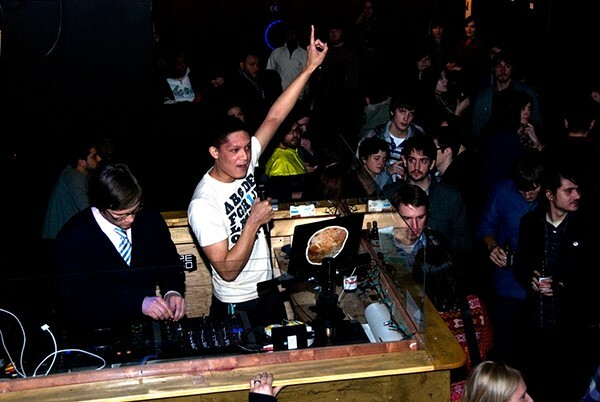 Mig Reyes, center, at the Merge party at Evil Olive in February 2010. Performances such as this would no longer be considered "music" under the current reading of Cook County standards. At an administrative hearing Monday morning, a Cook County official doubled down on a controversial position that the Reader first reported on last week: she explained to attorneys for two Chicago venues that live performances of rock, country, rap, and electronic music do not constitute "music" or "culture" by the county's standards. This is more than a cultural debate, though, because these definitions affect which small Chicago venues are entitled to an exemption from the county's 3 percent amusement tax on cover and ticket charges. Anita Richardson, a hearing officer appointed by the county's Department of Administrative Hearings, seemed to be arguing this morning that only small venues that book chamber orchestras, symphony orchestras, or operas should be entitled to the tax break—those relying instead on "rap music, country music, and rock 'n' roll" in addition to electronic music and DJ performances should have to pay. "Rap music, country music, and rock 'n' roll" do not fall under the purview of "fine art," she explained. Attorneys for Beauty Bar and Evil Olive took issue with the hearing officer's position. (The county is going after those venues and several others, in each case attempting to collect hundreds of thousands of dollars in amusement taxes dating back at least six years.) They said the shows booked at the establishments they represent are indeed culturally valuable enough to warrant exemption from the county's amusement tax. County code stipulates that venues with a capacity of 750 or fewer are not subject to the tax as long as any cover charges or admission fees are for "in person, live theatrical, live musical or other live cultural performances." A separate section of the code defines live music and live cultural performances as "any of the disciplines which are commonly regarded as part of the fine arts, such as live theater, music, opera, drama, comedy, ballet, modern or traditional dance, and book or poetry readings." Cook County commissioner John Fritchey says he hopes to gain support from his colleagues on the Cook County Board to amend the county's ordinance to reflect a city rule that includes amusement-tax exemptions for live DJ and other musical performances at small venues. Fritchey says the county's language "harkens back to the days of the 1950s when rock 'n' roll wasn't considered music." He adds, "No pun intended, but I think the county is being tone deaf to recognize opera as a form of cultural art but not Skrillex." A Chicago native who frequented the city's music venues in his youth, Fritchey says the county's position doesn't take into account the state of music today or its evolution over time. During this morning's proceedings, Beauty Bar attorney Matt Ryan argued that the Department of Administrative Hearings "shouldn't be in the business" of determining what is and what is not fine art. If it's music, he said, it should be exempt. "Your argument is honestly a stretch," Richardson countered. "I'm going to be looking for some rather persuasive legal arguments that will persuade me . . . that all music falls within the category of any of the disciplines regarded as fine arts." Ryan and an attorney for Evil Olive, Sean Mulroney (who's also a co-owner of Wicker Park venue Double Door), said that at a hearing scheduled for October 17 the two establishments will present evidence, including live music and testimony from a musicologist, in an effort to budge the hearing officer from her opinion regarding the cultural value of DJ performances. The attorneys said the county is seeking approximately $200,000 from each venue for amusement taxes going back at least six years, a figure that includes interest and penalties. Richardson said she would be "happy to hear your DJ witnesses" but insisted that the attorneys need to also supply expert musicologists to argue the definition of "fine art" and "further testify the music you are talking about falls within any disciplines considered fine art." Bruce Finkelman, a managing partner in 16" on Center, the development company that owns both Beauty Bar and the Empty Bottle, said that the county's position on the tax essentially means that anytime he wants to book a show at either venue he'll need to check with the government agency first to see whether the performance qualifies as "fine art." He said he's never paid amusement taxes for either venue in the six years since Beauty Bar opened or at any point in the quarter-century history of the Empty Bottle. The tax bill the county is trying to squeeze out of Beauty Bar, Finkelman said, "strangles everything we're trying to achieve"—as would the levying of the amusement tax going forward. Mulroney said that the small businesses can't afford to pay the amusement tax at all, whether retroactively or in the future. The county's motivation, in his view, is clear: "They're broke." He added that Beauty Bar and Evil Olive are obviously test cases—the county is going after them first to see if it can wring any more tax revenue from the city's live-music industry. Fritchey shares Mulroney's suspicions: he says every local and state government agency is looking for avenues to collect any and all enforceable debt due to budget constraints. "Even if I am able to change the ordinance, there is still the issue of back taxes," he says. Though he prefers not to publicly question the hearing officer's judgment or interpretation of the code, he emphasizes that these venues are not "tax deadbeats." He says the venues are making "a very compelling argument" that they are exempt from this particular tax—and that this legal debate flies in the face of what the county ought to be doing to foster creative and economic growth in the city. "Personally, I think we need things to incentivize musical talent and venues that present it, rather than make life more difficult for them," Fritchey says. The Cook County board consists of 17 commissioners in addition to board president Toni Preckwinkle. Contact information for Preckwinkle and the commissioners can be found by searching their names in the county clerk's directory. Beauty Bar is among several small venues that Cook County claims shouldn't have been exempt from an amusement tax—a decision that, if it stands, could shut them down.